One day very recently my wife and children were outside in a park socializing with another family. I joined at one point, and the husband told me that my wife had mentioned that I was reviewing some new amplifiers, and that she thought they sounded amazing; she hoped I would keep them. When we came home, I watched as she listened on the couch with our daughters to various pieces of music, and I saw her tapping her foot. I never saw that before, let alone hear her praise a component of my audio system! What were these amps you might ask? They were a pair of Audio by Van Alstine DVA SET 600 Mono Block Solid State Amplifiers at $2499.00 each ($4998/pr.). In a nutshell, each of these mono blocks is a mono balanced version of Van Alstine’s recently released and very well received Vision SET 400 Stereo amplifier ($1999 − $2199.00, single-ended input (RCA), reviewed by Audiophilia’s Martin Appel who awarded it an Audiophilia Star—and rightly so). This newer DVA SET 600 mono block is Class A/B, rated at 600 watts into 8 ohms and over 700W into 4 ohms; it weighs 36 pounds and is 17” wide, 13” deep, and 7” high. Its power is actually way more than what I just stated (via storing power in capacitors), as according to the Van Alstine specs it offers using burst measurements ‘775W into 8 ohms and 1500W into 4 ohms’. My Alta Audio Celesta FRM-2 reference speakers are 4 Ohms. Lucky me. So, with a pair of DVA SET 600 mono blocks you get power galore, and they can even power speakers at 2 ohms. I attended some of the listening sessions of the SET 400 Stereo amp when Appel was reviewing it, and I was deeply impressed; it is incredible at such a price. At that time, I discussed with Michael Levy (President of Alta Audio) how cool it would be if Van Alstine could make a balanced mono block version. Levy, it turns out, had already been thinking of just that, and after he discussed the idea with Van Alstine, the design was up and running in no time. I was astonished when Levy called me only several weeks later to report that he was burning a pair in and I could review them if I wished after the burn in; about a week or so later. I am grateful to Van Alstine and Levy for allowing me a first crack at reviewing a pair of DVA SET 600s; amazing as they are, I will describe more carefully in this review. When I spoke to Van Alstine—who has been designing and selling amplifiers since 1967—about the speed with which he built the new DVA SET 600 Mono Block, he explained to me his ‘KISS’ philosophy of audio design: ‘Keep It Simple, Stupid!’. So, he did. Starting with a SET 400 stereo amp, he used its original stereo wiring to run the + and − with respect to ground signal that would now be handed to it by a balanced cable (XLR) (from one channel (e.g., Left (L), or Right (R)) of a balanced preamp output). For example, if the source is the left channel (L), then + goes to the L+ of the stereo amp and − goes to the R− of the stereo amp. Voila! The stereo amp becomes a mono block with much more power (P) due to the doubling of voltage. In fact from P = V 2/R (voltage squared divided by resistance), the doubled voltage results in a power increase by a factor of 4. 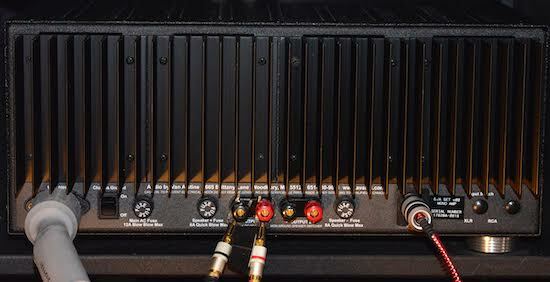 Audio by Van Alstine DVA SET 600 Mono Block Amplifier rear panel. The chassis are far from fancy schmancy; simple no-nonsense, metal blocks. The back of each unit is where the black heat sink grills are located, and that was very convenient for me since my audio cabinet (Salamander Designs) has an open back, but its sides and front door cover are not fully open (they are perforated with holes). I placed one unit above the other on separate shelves. The back of each unit also has an IEC power jack (120 Volts); you can either use the stock cord that comes with, or one of your own (I used my own high-end cords). For international use a 240 Volt (50-60 Hz) option is available at additional cost. There are two spades only outputs (1, 2) to a speaker to accommodate bi-wiring as an option (I did not bi-wire). It can be a bit dicey trying to connect with spades if your speaker cables are very stiff or heavy since the posts are on the lower part of the back blocked a bit from above by the heat sink grills—a little patience is needed since you only can connect from below. There is a grounding switch, too, as well as 3 external fuses: a 12A for the main AC, and two 8A for the speakers. Having external fusing is very convenient as many of us know from having a fuse problem with amps for which all fuses are internal, and we are warned not to open the unit ourselves—we must send the amp back to the factory wasting precious listening time and incurring possible shipping costs. The front face plate is sculpted with a simple, pleasant-looking, two-tone silver/grey 1/4” thick aluminum with a double anodized finish. The front includes a power on/off button and a small blue LED light above it indicating when the unit is powered on. I point out that the temperature of these mono blocks remains remarkably cool even with all the power it delivers. This was a surprise to me. Class A/B, biased as Class A at normal listening levels. The SET name stands for their unique Single Ended Transistor voltage design that utilizes a bipolar transistor front end followed by a MOSFET current amplifier section (using sixteen double-die MOSFET output transistors). Bandwidth is flat from 3Hz to 70KHz. DC stable. Will not generate speaker damaging DC drift even when driven past clipping. Uses an oversized high capacity torrid power transformer that is voltage regulated. Compared to what I have heard from using other amps in my system (or from hearing my reference speakers on other systems), the soundstage grew in size, particularly its depth, and a more 3-dimensional quality emerged exhibiting extraordinary intimacy, all on a pitch-black background. And there was an increase in minutia and transients exposed in recordings, along with more natural textures and dynamics. Timing seemed faster; more natural. Instruments in the imaging were taking clear advantage of the larger space provided to them and were now appearing with a more locked, pinpoint precision. Leonard Cohen, You Want It Darker, (2016), 24/44.1 FLAC, track of the same name. He was 82 years old when he recorded this shortly before his death, with lyrics such as “I’m ready my Lord”; his voice is still out of this world, “Deeper than a Siberian coal mine” (Someone came up with that spot-on description, but I do not know who). The DVA SET 600 soundstage exhibits him larger than life; way up high as if in heaven. Somber but truly outstanding. Jennifer Warnes, The Well (CD rip, 24 Karat Gold Edition (2010)). So present, smooth; often while she took a breath while singing with her textured alto voice, you could hear it. My current favorite track is The Panther. It really showed off the exceptional sound- stage and 3-D imaging offered by DVA SET 600s. It is intermingled with gentle various acoustic percussive sounds, such as bells and wooden blocks, in addition to snare drum work and then even electric guitar. The various instruments cover all ground; the gentle snare appears vividly to come from way back left in my apartment—in another room, and the bells sweep back and forth across the sound stage strongly suggesting that there is something (a panther?) lurking in your home. Peter Gabriel Passion: Music for the Last Temptation of Christ (CD rip, (1989)). Some of the tracks, such as Troubled and The Promise of Shadows, have the great jazz-rock fusion drummer Billy Cobham on drums and percussion. Deep/thunderous tom toms. It can be so creepy and haunting at times and one gets the impression of a surround sound like soundstage presentation coming out of just two speakers. Cantata Domino, track 12 Maria Wiegenlied 24/192 AIFF (from the original 1976 analog master), Naxos (2004). This is the piece that alerted me to something special: the DVA SET 600s were picking up sounds that I never ever noticed before: the compressed air flowing into the pipes from the magnificent pipe (church) organ. It is so immediate on the DVA 600, as soon as the piece starts it is there, and comes back frequently throughout. This was first pointed out to me by Levy when listening to the SET 400 stereo amp. Sounding a bit like white noise, I assumed initially that it was some kind of distortion in the audio system; nope. Randy Weston & his African Rhythms Trio, Zep Tepi. 16/44.1 FLAC, Random Chance Records (2005). Jazz with African influences. Weston’s piano now fits in my sound-stage, so clear and vibrant, and I can hear someone (I suspect the bass player Alex Blake) often talking/whispering under his breath (in addition to the various regular utterances/singing); anyhow, I can hear it! Super rhythmic back and forth between the piano and bass (using a bow, or plucking it, or tapping on it); layered with lively African percussion. Dire Straits Brothers in Arms, track 7, The Man’s Too Strong, CD rip (1985). This one really scared me when it got to about the 1 minute 18 second mark where the electric guitar riff comes blasting at you! Jeez. Is that an example of a burst? Polarity—an acoustic jazz project by Hoff Ensemble 2L, 24/352.8 FLAC file. This album shows off the the depth of the soundstage—you sense you could start walking towards your speakers continuing behind, and first pass the piano, but then pass by various drums along the way stationed very solidly in place. And the clicking sounds of sticks or gentle bells—echoing off walls that can’t be seen. You can figure out the spacial layout of the venue (or at least you sense you can). Astonishing. Quiet Revolution, an all acoustic, drummer-less jazz trio with Ben Allison (upright bass), Steve Cardenas (acoustic guitar), Ted Nash (tenor saxophone, clarinet). ((2018), Sonic Camera Records). Originally recorded in 2015 as vinyl only on Newvelle Records, this is a just released digital 24/88.2 FLAC file remixed/remastered (mixed and mastered by Ben Allison, Allisonics Studio) and it is truly intimate sounding through the DVA SET 600s; exceptional. The soundstage has Allison further center back, with Nash closer up front right, and Cardenas more center left. But all are behind the speakers in the soundstage. Rich, full, and with life-like clarity. Every nuance and detail can be heard; staccato and legato with beautifully crafted flicking by Cardenas (and the sliding on strings, tasteful little squeaks), air from the clarinet and sax, and the masterful plucking of the bass strings by Allison. Track 4 The Train and the River written by Jimmy Giuffre in 1957 (The Jimmy Giuffre Trio is the main motivation for this album), playful and folksy, is really a treat, as is Track 6 Bimini with some exotic influences, and Allison does some solo parts (with Cardenas gently in the background) too. Absent clapping, this sounds like a live recording on the DVA SET 600s, and the trio are obviously having great fun. The Bennie Maupin Quartet, Early Reflections, (CD rip, Cryptogramophone Records (2008)) the track Escondido. The bass clarinet is so intimate and close up; it comes at you including the sound of the blowing of air by Maupin; remarkable. The DVA SET 600s do not try to pull any wool over your eyes, instead they pull wool out of your ears. And at a price of just under $5000/pr. they have no equal in sound quality that I know of. I would even argue that at double that price, they have no equal; they best some amplifiers that cost significantly more than $10K per pair. Van Alstine recently told me that the DVA name used in this amp and others in his line of solid state amps is in memory of his late wife, Darlene Van Alstine, who passed away 20 years ago. I can only assume that she would have tapped her foot, too, if she could have heard the DVA SET 600s. My own wife’s wishes will be honoured; in our home the DVA SET 600s will stay. Two steps forward, zero steps back. From my perspective, Frank Van Alstine is an unsung hero in amplifier design. Music Player: Mojo Audio Deja Vu Music Server-with Linux OS, Roon and Tidal. Interconnects : Anticables Level 6.2 ABSOLUTE Signature RCA, Anticables Level 4.1 Reference PLUS Xhadow (with cryo option) XLR.